Admittedly, the only reason I read this was because I love Dan Jones. Religious orders, along with the Crusades, aren’t really my area of interest. I love learning about medieval theology/Christianity, but this isn’t my huge area. But, I liked it. I think it was a solid book and I was able to identify areas that really interested me. I think the part that tried me was the way it never quite focused on the Templars themselves. They were there, always in the background, but it was more about the various rulers that they were against or partnering with. I wanted to know more about the order and what they did. What they thought. What they believed. What they taught. And the book focused outside of that. That’s not a bad thing, but it wasn’t what I wanted to know. The part I found most interesting was the fall of the Templars. God, that was a fascinating few chapters to read about the rulers who decided to do it and the things that they were forced to admit. 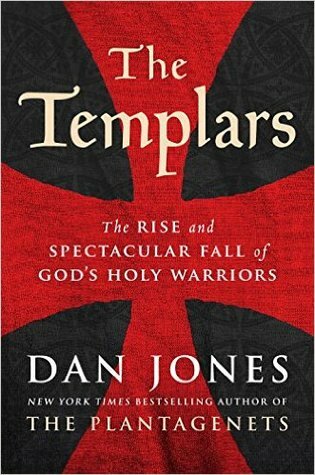 That was so interesting to read, along with the brief epilogue on how the Templars, despite being gone for centuries, still lives in our imaginations. So, for me, this was a good overview. And Jones does overviews very good. If you haven’t checked out his book about the Plantagenets, I highly recommend it because it condenses a huge amount of history into a concise book. But, this book mainly helped me realize what areas I’d rather like to learn about if I decide to do more reading about the order. What era of history interests you the most? Crusades is not really my favourite period of history… I confess I like modern history from the Victorians onwards. I wish I liked modern history. I have areas I like, but it’s not something I love.